Labrador Retriever is inarguably the most popular pet dog breed in India and the most common question we face from pet owners across our chat, emails and phone calls is a suggestion of a diet plan for their lab puppy. So, if you have just bought your new pupper and wondering what to feed him/her, you are at the right place. Although I am not a veterinarian myself, I have been a lab owner for 11 years and been in the pet food industry for the last 6 years. In the course of my journey, I have met countless dog owners, breeders, participated in many dog shows and visited/spoke to many registered veterinary practitioners. So, in this article, I would like to share my experience regarding the most suitable diet for a labrador puppy/dog based on the food and supplement options available in India. 1)Labrador puppy age(0-3 months) – If you are buying or adopting your puppy from a good and responsible breeder, it is highly unlikely that he/she will allow you to take the puppy away from his/her mother before 1.5 months age. However, if this is not the case for your pupper, no need to worry. Although your pup won’t get mother’s milk, you can feed him dog milk available in the market. Be sure not to feed normal cerelac or cow milk as that will result in loose motion as well as stunted growth. Among baby dog milk, there are various options from well-known brands like Royal Canin, Drools, Farmina although I personally prefer Beaphar Lactol or Royal Canin Babydog milk.At this tender age, you need to feed your lab pup via feeding bottle like you would feed a human baby of age 2 months. Milk is the only food apart from purified water which your dog is gonna need till 1.5months. After this age, till 3 months you have two options. You can either continue with milk or look at starter food options like Royal Canin Maxi starter, Drools starter, Farmina Puppy Starter, Canine Creek Starter, Orijen puppy and plenty of other brands which are available in the market. The kibble for starter food is small and most probably, your puppy will be able to chew it. In case he/she is not, consider adding the dry food into a blender with lukewarm water and make a mix which should be dilute enough to be administered by feeding bottle. Certain dry food can be extremely hard to chew, so depending on the toughness of the kibble you might have to break i.e – blend the food yourself as your puppy might not develop good teeth at this age. 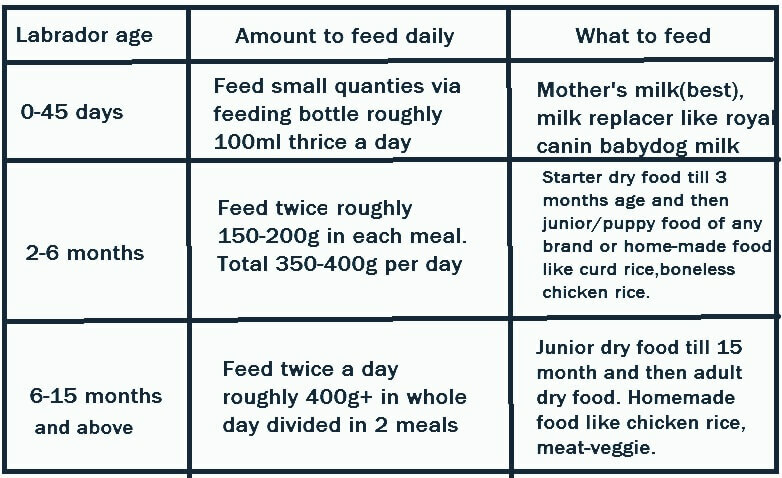 Puppies of age 1.5 – 3 months should be given around 200g-300g(total) of feed divided in separate meals in a whole day. You should be following this diet of starter food till 3 months age at least. Also, make sure you are vaccinating as well as deworming your pup at the right intervals. 2)Labrador puppy age(3-15 months)– Your puppy will grow to the maximum extent in this age span. So, a proper nutritious diet is essential to achieve good growth. You can either go for Royal Canin Maxi Junior or Royal Canin Labrador Junior or puppy variants of other brands like drools, canine creek, Orijen Puppy and Junior(Recommended), Acana large breed puppy, pedigree(not recommended) at this age. If you are giving a good diet like Royal Canin, farmina or even home-made food, growth should be good. For those who can extend their budget, you can go for something even more premium like Acana, Orijen, Arden Grange and the likes. No need to add additional supplements. If you are feeding home-made food like boiled chicken which itself is a very good food option, consider adding some fish oils like Beaphar Salmon Oil. In case, you are going for filler-prone options like pedigree / drools, supplements like Bone builder / Kalk tabs will be useful. Puppies of age 3-6+ months should be given around 300g-450+g of dry food per day. 3)Labrador dog age(15 months onward)– Your puppy is an adult dog now. It’s highly unlikely your dog will grow further in length and height after this age. However, a good diet is recommended to ensure a good life span(above 12 years) and muscle development. For those who want Royal Canin, you can go for Royal Canin Labrador adult. You can also go for more premium brands than Royal canin like Farmina N&D, Hill’s, Orijen, Acana and more. Homemade food can be a healthy option as well. Remember, lab is a high energy dog, so regular exercises/walks are very essential. Feeding guide(amount to feed in grams) depends on dog weight and varies from brand to brand. You will find the recommended portion for your brand based on the calories it carries on the packet you will buy. Once your dog has reached 3 months age, it’s best to feed him/her twice a day. If you feed thrice, four times or keep food available in front of the dog all the time as many dog owners do, he/she is likely to lose interest in the food and not touch it at all. At other times, you can give chews or treats but whole meal should be fed not more than twice a day. Do not keep food available in front of the dog except during his eating time. However, you can keep water available in a bowl all the time. Sticking to schedule regularly is recommended. Wait, till now we have been speaking about commercial dry food. What if your dog or puppy doesn’t like any dry food at all? Yes, this happens to many dogs. While some dogs like pugs are voracious eaters, labs or goldens can be extremely choosy. At infant age, regardless you are giving milk or dry food blended in water through feeding bottle, puppy will eat/drink it. They will eat whatever liquid you put in the feeding bottle at this age. However, once puppies mature and learn to eat themselves, they may not like dry food, rarely touch it. In these cases, the best option is to first add a home-made additive with the dry food. You may add many things dog like in small quantities of chicken stalk, chicken pieces(boneless for puppies), curd, egg and others to the dry food. Changing or trying out another brand helps as well. So it’s best to buy a small pack before trying any new brand.I have seen many dogs who hate Drools but like Canine Creek although they are manufactured by same company. Every dog has a mind of his own. If you can’t add any home-made side dish, adding less nutritious but delicious wet food like drools holistic blended meals, pedigree chicken gravy, smart-heart chicken liver gravy etc into the dry food can change your dog’s mind at times. In the end, either you can choose from some of the best commercial dog food brands available in India or you can go for totally home-made food if your dog doesn’t like any brand of dry or wet food. Most common diseases of Indian bred dogs like canine hyp dysplasia, ear infections, bent hind legs can happen to any dog. Take your dog to a registered veterinary practitioner in case such situations arise. Lack of appetite is also observed during this age at times. For not-so-severe cases, you may administer Himalaya Liv52(syrup or tabs) or other appetite stimulants of various brands twice a day for 1-2 days. In case, your dog has gastrointestinal disorders, referring to a prescription diet under the guidance of a veterinarian can be immensely helpful. If you have more questions regarding your Labrador dog/puppy and his/her maintenance , feel free to leave a comment below or reach us via the chat option from the bottom-right corner of this page. We have access to registered veterinary practitioners who can help your dog regardless of breed/age. I buyed a lab about 40 days old. I have given milk for 1 and half days and later she vomited many times. Please suggest me that is cerelac wheat good for her. Don’t give cow milk. Go for starter dry food or something like beaphar lactol.Nestle Cerelac wheat is for humans. Should cause the same problem of vomiting/loose motion in pups. Yes, it is. I give my lab Nestle Wheat, Apple and cherry ceralac. And she loves it. Just give her one spoon of gripe water once at night 30 mins before putting her to bed. My Labrador puppy three months old present feeding Maxi starter royal canin shall I go to the junior royal canin or any other plz suggest me sir? You can switch to either maxi junior or labrador junior at 3 months age. Make sure puppy’s tooth has developed before switching. How many months we go for first bath any Labradors puppy sir ! My puppy is three months old . Nope, you can start bathing a puppy at 3 months. My lab is 5 mnth old..what is bettr daily feed? You can go for Farmina maxi&medium puppy or royal canin maxi/labrador junior. You can give at any age. Pups love bones. Calcium bones will be good. My Labrador is 2years old and in past few months he has developed a Habit of eating different objects whenever he goes out for walk and his X-ray has detected some stones in his stomach. And he vomits the food sometimes and take out the food after meal, I have tried so many doctors and treatments for him. Normally dogs vomit out foreign objects they eat. Vomiting or induced vomiting by vet is the only way to prevent surgery. Take him to a vet where they can induce vomiting using gas. If he vomits himself after food, feed him again. Most likely his body is trying to push them out by vomiting. Sir, my labrador puppy entered into 9th month and was weight 36.5kg is it over weight or not ….I’m feeding Royal canin junior. Please let me know about it? At 15 months, most weigh 30-36kgs. Slight deviation is normal. Give him some exercise. my labrador is 45 days old he cant stand properly or walk he keeps on sleeping is it fine ? Change his diet. You can look at weight control diet like royal canin satiety or weight control. Sir.. my lab pup is 2 month old and his musscle are not growing I am using cannin Creek starter..plzz suggest better option..
You can give starter dry food blended with water in a mixer grinder. Cow milk can cause indigestion. Im having a labrador puppy 11 days old and his parent is not enough to fed up the puppy so what should I do to fed up puppy can I give him a cow milk. Ideally dog milk replacer should be given as cow milk can cause digestion problem in pups. Mother’s milk if available. Otherwise milk replacer/starter dry food. Hi, i bought golden retriever which is 21 days old now. I gave morning and afternoon nestle cerelac and royal canin starter for evening and night..so my question is can i continue giving my dog royal canin starter or should i feed my dog Beaphar Lactol? And what will be feeding timings? Can i give 4 timez a day? I won’t suggest cow milk for pups. You can give beaphar lactol though. Or you can give starter food blended with water in mixer grinder through feeding bottle. Farmina, orijen are best. Royal canin,drools focus are value for money. Pedigree,regular drools is crap. Hi sir,i have labrador female puppy which has age is 80 days old i feed her royal canin maxi starter noe can i switch to maxi junior? You can go for junior from 3 months age. My lab pup is 2 months old. I want to start training him as early as possible. I am already giving him maxi starter 4 times a day. Can i start giving him treats as reward? If yes, what type of treat would be good for him? You can give chew treats like choostix or chipchop chicken tenders. My lab is 3 year old … daily want chicken .. what else can i give to lab with chapatis indian bread instead of chicken…. and what about the mating… is it necessary to allow dogs to mate. I have a Labrador puppy age of 42 days and i am giving her cerelac twice and royal canin startar twice in daily basis. Should i keep it or go with only startar pack. Right now her weight is 6.5 kg.is that right amount of weight at her age???? No need to give cow milk cerelac. Mix starter kibble with lukewarm water, run in grinder and give via feeding bottle if she can’t chew yet. And what about the weight ? 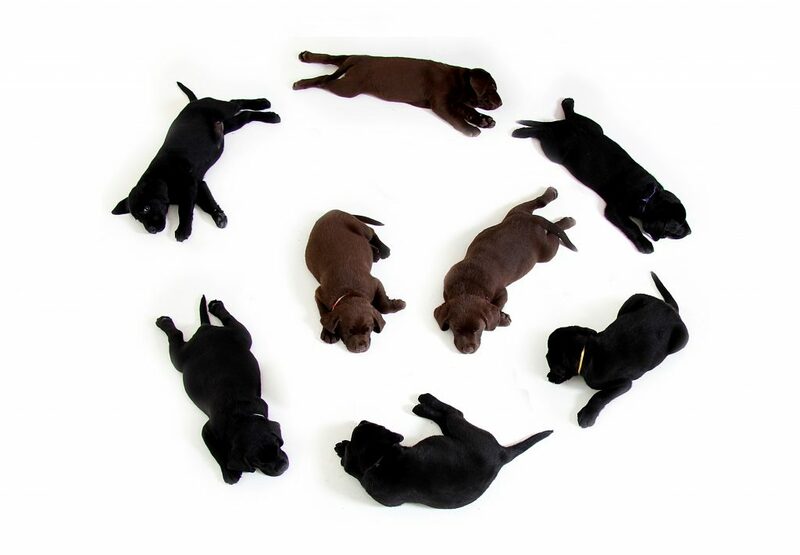 At 45 days, lab puppies weigh 5-5.5kg. Hi my lab is eight months old . I switched him to home food as he developed allergy to kibble. I am giving him khichdi with veggies two times a day . How much of food should I give him at s time . There are many dry food for dogs prone to allergy like hypoallergenic diets. You can try them as well.Dogs need meat.Feed up to 200-250g a day. Feed the best you can. Do not think of weight at this age. A 9 week pups can gain as much as 1kg in a week. Try out some home-made food rich in protein or better brands like farmina or acana if you want better diet than royal canin. Hi, My Lab name Fluffy is 10 weeks old male Puppy. I am giving Puppystart Celelac daily once early morning and Royal Canin Labrador Junior from 10th week. Till 9 weeks I gave Royal Canin Maxi Starter . The growth is excellent now with good structure. Never give cow milk or any other foods apart from Royal Canin until it reaches good growth and structure . Please don’t think about heavy weight as this breed might get Cholestrol fat due to heavy weights . If you feel your puppy should develop good texture and bone growth you can give supplementary like FishOoil , Skycal, Petup and some calcium sticks for Good Teeth Maintenance and toning. We adopted 45 days Lab puppy as on 30th May 2017, the day we adopt her went to Doctor for check up and her weight was 2.300 kg. now she is almost 2 months puppy we have started giving her Royal canin maxi starter twice daily (around 20 gm per meal) and three time lacto gen as per Docs prescription. Also we have added Vitamin and Enzym pet during her lunch and dinner time. Now not sure why we are feeling she is not growing as much she should grow like other lab puppies. May be we are wrong. Can you please guide us if we should increase her Royal canin amount for good growth. You are feeding good. Pups can gain as much as 1kg per week. Just need to wait more. My labrador dog at 43 days is just 2kg.i give her some rice and chicken and ceralac.it’s good for health to her? Chicken and rice is good. Make sure it is boiled and boneless for puppy. Hi My labrador is 9 weeks, From when should I start giving him some solid home foods, because I do not trust any brands and want to provide healthy home food, what can I give Inform of Solid foods, I’m thinking to provide rice, chapati, dal, bolied bone less chicken, and need suggestions. Hi my lab puppy is 2 months old,i want to know can i feed drools focus starter for 4 times a day like 200-250g..kindly let me know about this..
My labrador is 15 months old and weighs 45kgs. I feed him twice a day (2 chapaties in curd). How do i make him lose weight? Try feeding weight loss dry food or regular home-made food low in fat. hi. i have golden retriver he is 38 days old. what should i feed him and which cerelac is good for him. how many spoons in what time?. its my first time of keeping a pet please suggest . Cow milk is not recommended. Go for starter dry food, blend it in mixer with water. Go for starter dry food of any brand you prefer. Cow milk cerelac is not recommended. My lab is 7 years old with a hip dysplasia problem. please suggest a healthy and weight loss friendly diet for him. If you dog has difficulty walking or getting up, you should go to a vet and get x-ray done first to determine the severity of HD. I have 2 1/2 months old female lab-retriever puppy. She’s having 5 meals/day (50g per meal with Royal Canin Maxi starter). Yes, you can bathe her. Sweet potato, carrot, papaya,watermelon, most fruits apart from citrus fruits like lemon are good. I adopted 37 days old lab puppy having weight of 2 kg and giving royal canin mini starter since last 4days, 20gms 4times, is it ok.
Mini is for smaller dogs like pug. Go for maxi variants for lab. Hi,my lab puppy is 37 days old, i am giving cerelac and curd .. he is not drinking water. And every 2 hours once he used to wake up and always peeing.. is that ok ? should i change his food habit. Cut the cerelac. Give doggy milk or starter dry food through feeding bottle. Please help me … my labra puppy is just 45 days old and doctor has suggested me to give him 10 gm of puppy cerelac 4 times in a day.. with Luke warm water but I could see it’s insufficient for him and he warned if Fred him more than it then my puppy wud start having loose motions… kindly suggest me what to do please please..
Hi sir my dog lab I can give milk it is good for health..
Mother’s milk or milk replacer. Not co milk. Hi my lab puppy is 5 months old his weight is 15 kg is it OK. Now I m giving him Royal Canin junior. Red rashes can be a sign of allergy. Fnd the root cause of the allergy. Around 150g-200g in each meal twice a day. My labrador is 14 months old and he is shedding too much hairs, i took him to a vet and he suggested a syrup but still no difference, im too worried about him,can u please tell me the reasons and cure. Brush him thoroughly twice a day, that should take care of shedding at other times of the day. You can incorporate fish oil into meal. Make sure there is no fungus or fleas causing the shedding. My German Shepherd puppy is 2.5 months old. Previously I was feeding drool German Shepherd puppy food. Vet suggested calcium syrup. Now I changed to drool focus puppy food, whether should I continue calcium syrup or not? Yes you can continue with the calcium syrup. Try looking at a better brand like royal canin or farmina if budget permits. I just adopted a Labrador who is approximately 3 years of age and weighs 26kgs. I give him Rice and chicken. 200gms per day. Is it okay? Increase the quantity, rice and chicken is good food. My lab dog is 36 days old.. I am giving to him cerelac with milk and also give him curd… I just want to know that what is good feed for him… I am confused in feed feed option. Plz suggest to me. Give puppy milk replacer or starter dry food, curd is ok.
Hi my male Labrador is about 4 years now. 1) Is it necessary for him to get mating? 2) He is facing skin infections for last 2 months. Vet has given antibiotics and spray but of no use. he is facing itching prob. can you suggest some good medicine for him? Hie, My lab puppy is 2 month old. Can you tell me what to feed him? Please tell the thing that is easily available in the market as well. Moreover, how many time should i give him bath? and can you tell about vaccinations also? I would be very thankful to you. You can feed him starter version of any dry food or home-made food like boneless boiled chicken rice, curd rice etc. Bathing once a week should be okay. Vaccinations should start ideally right since puppy is born, you need to talk to your breeder or adoption center to know what vaccinations have been previously given. At this tender age you should feed him mother’s milk or milk replacers till 45 days at least. Feed 3-5 times now. After 50days age you can go for starter dry food. Feed not more than twice a day after 6 months age. there r lots of ticks r der how to managae it and to recover my pups? For ticks, you can try flea and tick shampoos. If they don’t work as expected, you can go for injection or oral treatment. Dont give cow milk. You can give boneless chicken drools , boneless chicken rice or try other dry food brands. My labra is 8 months old..and we are vegetarian, so is it necessary to provide them meat..we are providing him pedigree. Pedigree has mostly grains & fillers. For good growth, meat is necessary. Hi sir my lab is 4months old and she is thin like 5 kg I give 4times food per day but she won’t eat sometimes I feed her ragi malt and royal canin ( junior Labrador retriever ) but she is very active puppy but her growth is very low … please suggest me what should I do … is there any medicine for growth and weight gain ? Ideally, you should feed your dog not more than twice a day. If you feed dry food 4 times, she will grow tired of the food. You can try adding boiled chicken pieces or gravy food to dry kibble to make it more attractive. Joint or vitamin supplement may be useful but that won’t be a substitute for food. You can also give appetite stimulants like liv52 pet or skyec herbatake pet. Can u suggest something to compensate breast feeding. You can go for milk replacers like royal canin babydog milk, samolac or beaphar lactol. These are much better than human baby cerelac when it comes to puppies. No need to add vitamins, supplements etc apart from milk at this tender age. I have a 9+year old female Labrador. She is has gained much weight. I would like to know what diet plan i can follow to bring her back to her initial figure . She becomes very tried easily. She has become very lazy. We prefer vegetarian diet and yes can also give eggs if adviced. Please help me. I am very worried for her. Give her less quantity of food and get her some exercise. You can try weight management dry food of various brands available like hills r/d or royal canin satiety. Decrease portions of rice and other grains, increase the quantity of protein in diet. sir my puppy is only 18 days.what food I feed to her. Puppy milk replacer of any brand by feeding bottle.